Mezzotint with engraving of a view of Tellicherry (Thalasseri) by Elisha Kirkall published by John Bowles in 1735 after a painting in East India House by George Lambert (1710-65). Tellicherry is situated south of Cannanore in Kerala. It was founded in 1683 by the East India Company and became the major trading centre for pepper and cardamom in India. 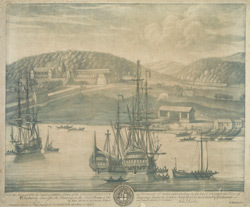 Trade was controlled from the fort in the town, which is seen in the left of this view and was built by the British in 1708.